But because of the way we count carbon emissions, German coal power exports to its neighbors (including France, which is a major net importer of German electricity) will make Germany’s carbon balance look a bit worse than it is in reality. Craig Morris explains. In Germany, renewable power has priority on the grid and therefore offsets conventional electricity. The result should be less production of coal and nuclear power – were it not for power exports. Imagine that Germany is an island without any grid connections to other countries. Power cannot be imported or exported. What would German carbon emission statistics from the power sector look like? Let’s take a look at the month of October 2013 (and if you want to make sure that month is not cherry-picking, January-September are also available from this PDF). 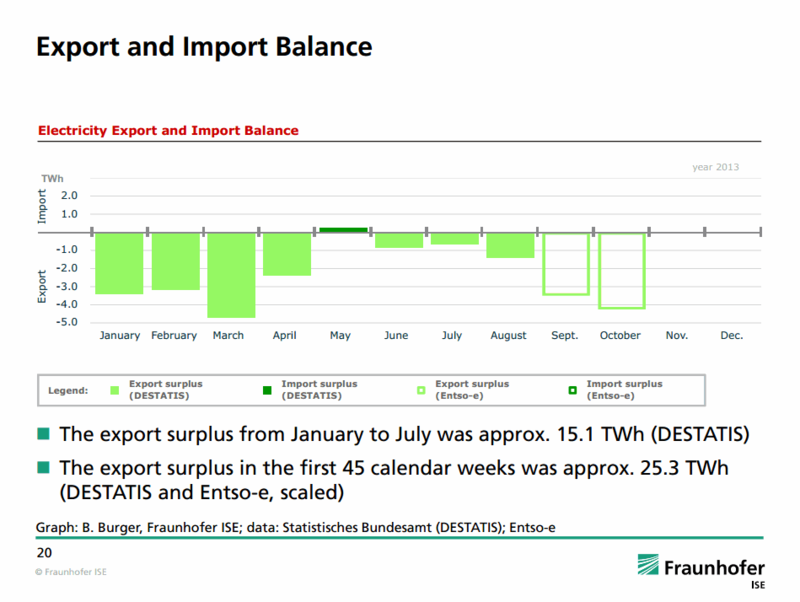 We see here that Germany was nearly constantly a net exporter of electricity (green at the bottom), a situation that is a bit different during the summer but quite the same from January to March. As I previously explained, Germany exports power when demand is high (in the winter) and imports when the prices are low. We see that there are two dips in conventional power production (the large gray area), first around Thursday, October 3 (an anomaly I dealt with here), and then around Sunday, October 27. 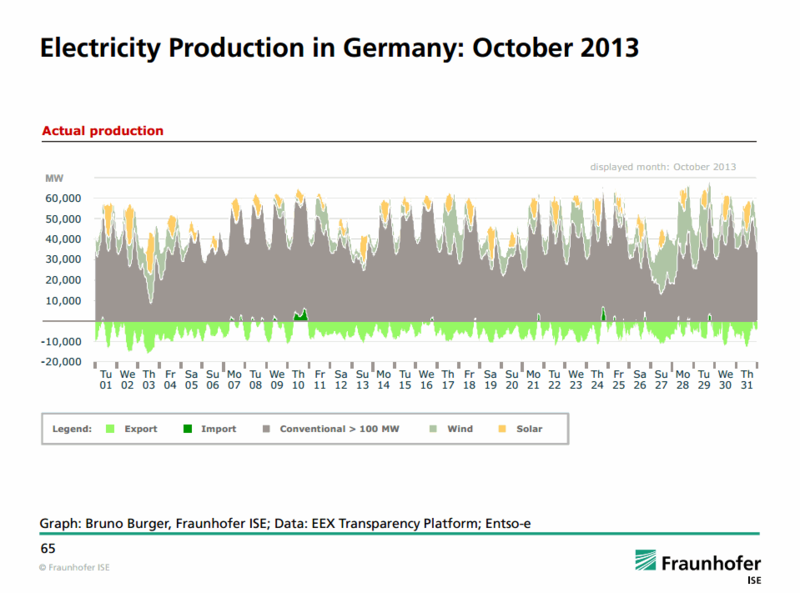 Only on Thursday, October 10, did Germany become a net importer of electricity for a substantial number of hours. Now, let’s zoom in to October 28, to take a closer look, and we get these charts from this other PDF. 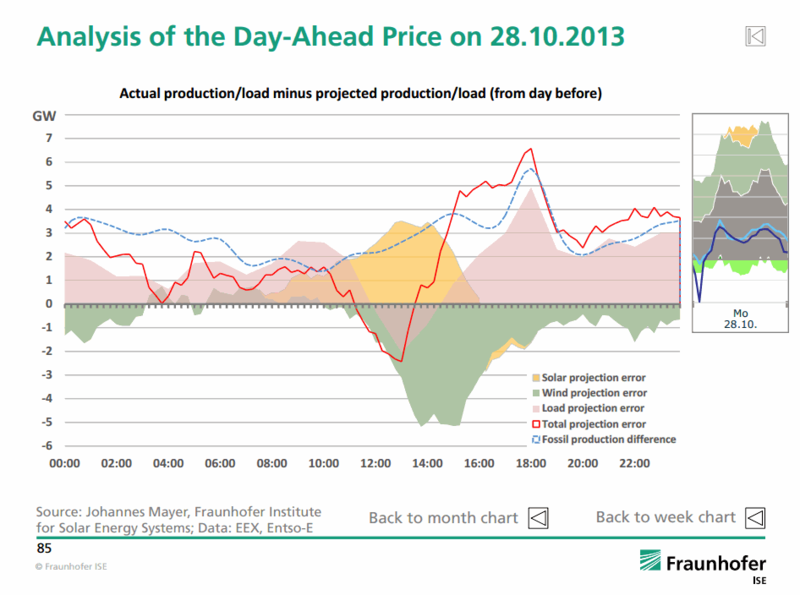 The researcher who made this chart is focusing on how errors in forecasting affect power prices on the exchange – we will stick to our discussion and focus on the box on the top right, which represents power production and exports (the green area at the bottom, as in the previous chart). We see that, at the beginning of October 28, we are just coming out of the low level of conventional power production on the 27th. Essentially, the green area hanging down in both of these charts represents the amount of electricity that conventional power plants would not be able to produce if Germany could not export power – in other words, Germany’s nuclear and coal plants are increasingly running for export. They reach such low levels of production that exports are the only thing “propping them up.” The next chart shows the import/export balance for 2013. Only in May was Germany a net importer. The empty boxes for September and October indicate that these figures are still preliminary. Germany exported a record amount of electricity last year – 22.8 terawatt-hours. But already, Germany has reached a new record of 25.3 terawatt-hours, and it is likely to surpass 30 TWh when we add on November and December (roughly at the level of January and February). Carbon emissions from coal power are counted where this power is generated, not where the coal is mined (such as in the US, which is being praised for lower carbon emissions even as coal exports hit record levels) or where the power is consumed. We thus have a situation in which Germany is increasingly providing coal and nuclear power to neighboring countries. 30 TWh is roughly 5 percent of the less than 600 TWh generated in Germany over the year. If we assume that around half of that amount is coal and half nuclear power, some 2.5 percent of German power generated this year is coal power for export. If Germany were an island unable to import or export, that 2.5 percent of exported coal power would not be generated. It would then also be deducted from the country’s carbon emissions. And we would more clearly see how well renewables can offset nuclear and coal power. But as things stand, countries like France and the Netherlands will probably be praised for keeping down their carbon emissions, while Germany – which exports a great amount of coal power to these countries – will increasingly be criticized. Okay, lets extend that to the US. The UK imports about 20% of the steam coal it uses for electrical production from the US. Germany is also importing a significant amount of coal from the US. Mining operations result in CO2 emissions from all the equipment… In the US coal is increasingly becoming an exported resource, as the US switches to renewables and natural gas. If you deduct the CO2 related to the 2.5% electrical generation in Germany and exported across the border – perhaps the US should also be able to deduct the CO2 emissions that were a result of the mining and export of coal, wheat, or other products to Europe. And perhaps Canada also? The Americas and Europe should also then be responsible for the CO2 emissions that are a result of exports from China? Once you start begin the process of trying to transfer CO2 emission from one state to the next because of energy or any product export – the whole process becomes quite muddy. It should not be done. The CO2 emission caused by the 2.5% electrical export belongs in the country that generated it. The CO2 generated by mining the coal in the US belongs to the US, the CO2 emissions that are a result of commercial activity in China – belong to China. If a country wishes to reduce their CO2 emissions – they should then look at how they can improve the efficiency in the processes that resulted in the emission. For electrical generation, that means reducing transmission losses, using advanced coal plants instead of old technology, including — finalizing the rules for carbon capture and sequestering. Fix the efficiency problems first and address the legal issues with CCS.